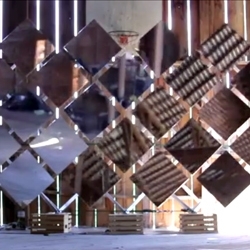 Musical artist Alfred Weisberg-Roberts, aka Daedelus, performs on stage in front of this kinetic sculpture with tiled mirrors. This is a sneak peak into his stage setup for future performances. Check out his music here.